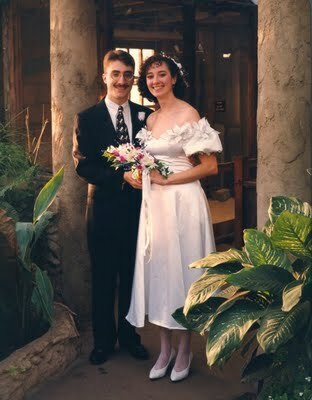 Fifteen years ago today, my husband and I were married. A church wedding was out of the question and the thought of parading in a frilly dress in front of everyone I know gave me the cold sweats, so we went low-key and had a private ceremony at the Sinnissippi Gardens greenhouse in Rockford, Illinois, my hometown. It was all decked out for the holidays and filled with red poinsettias, which made my wintery color palette of white and royal blue look a bit more patriotic than I'd intended, but oh well. 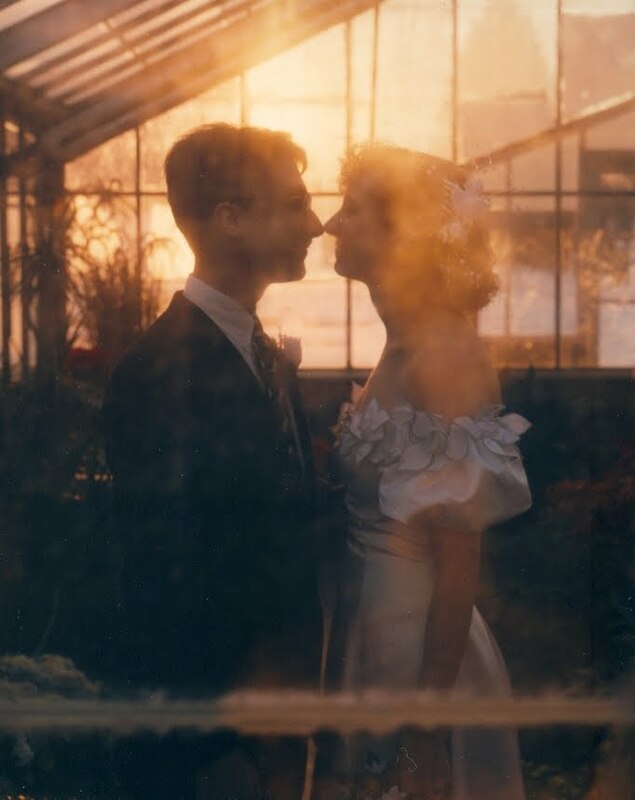 The greenhouse housed a collection of small animals and there are a few budgies and iguanas in our wedding photos. If we were getting married now, we'd probably choose a fancier place like the Garfield Park Conservatory, but we were young and poor and nostalgic in 1994, and Sinnissippi suited us nicely. As the winter sun set on one of the shortest days of the year, the warm light filtered through the frosted glass and gave us a rare peaceful moment on that crazy day. The greenhouse was a bit run-down and underutilized even back then and was torn down this year to make way for a more elaborate conservatory. I regret that I didn't make it back in time to take more pictures before they tore it down. The place held some nice memories for me besides the wedding; I did my "job shadow" with one of the master gardeners at the greenhouse back in 8th grade, and when I was in high school the whole town flocked there to witness the blooming of the century plant. I'm happy to see Rockford get another nice botanical installation to go with the Klehm Arboretum and Anderson Gardens, but I will always feel affection for the scruffy old greenhouse by the river. Happy anniversary! I felt exactly as you--no church and I hated frilly dresses... 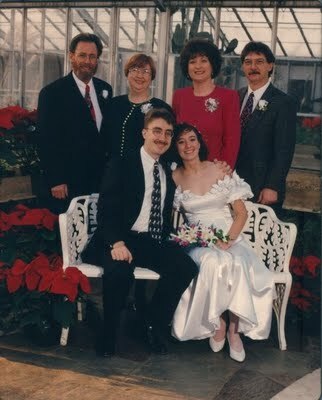 I got married in a courthouse... wish I'd thought of a garden or conservatory... I guess that explains why I only made it to 13 years! :) P.S. Budgies? To me that means parakeets, but.. um... ???? Happy anniversary Diane! Looks like you had a lovely wedding. Congratulations on fifteen years of marriage! My husband and I went off to Jamaica for a private wedding, and I can definitely relate to avoiding the church wedding and not wanting to be the center of attention at a big affair. My daughter and her husband had a small wedding - only close friends and family at the wedding, with a larger reception afterwards. They are both outgoing and not generally shy, but were so nervous about getting up in front of everyone to say their vows that their doctor prescribed anti-anxiety meds for their big day - something neither of them normally take or need. There's a lot to be said for keeping it small and private. Congratulations! It sounds like it was a lovely ceremony! My husband and I also had a small wedding that took place in a courthouse rather than a church. Happy anniversary! Thanks for the nice anniversary wishes! It seems hard to believe how much time has passed, but I definitely prefer being this age than that silly young kid (though I miss the lack of gray hairs :)). Monica - The budgies are lurking behind us in the flight cage! I remember my father-in-law spent a lot of time photographing the animals; I bet he has more pictures of animals than of us in his album! Linda - We did our honeymoon in Jamaica and while we were there we asked ourselves, Why didn't we just do the whole thing here?? Of course, family pressure, blah blah blah. I totally can relate to the need for anti-anxiety meds on that day. Rose - Thanks! I've been to big weddings and small, and even as a guest, the small ones are so much better! Funny thing is that today I was wondering how many people get married in greenhouses and conservatories and then I clicked on your post to see you wee one of them. Anyway, congrats and may you both have many more happy anniversaries.